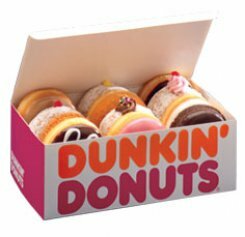 Dunkin's Shanghai shops will feature -- in addition to its regular fare -- items tailored for local tastes including honeydew melon doughnuts and mochi rings, which are similar to doughnuts but are made with rice flour. We can only hope that the donut-wielding monolith ships spokesperson Rachael Ray over to Shanghai as part of the expansion plans. I'm sure she'll find the mochi rings "Yum-O!" while sitting by the Yangtze.